Xigmatek debuts the Midgard II, a new mid-tower case with USB 3.0, a rubberized surface feel, a hot-swap bay, and room for up to eight fans and a 280mm radiator. The successor of the popular Midgard Mid-Tower is getting ready to step up to the plate. Xigmatek has once again managed to fill the Midgard II with a long list of unique features for the demanding PC enthusiast. Just to name a few: USB 3.0, a rubberised surface by the name of "Leather Touch", a hot-swap bay in the top, room for up to eight fans and a 280 mm radiator - all for an unbelievably low price! When Xigmatek presented the original Midgard in 2009 as their first chassis, it managed to capture the hearts of PC users all over the world. The reviewers praised it, the users loved it. This secret behind its continuing success is quite simple: at the time, the Midgard was at the top of its game in terms of technical aspects by offering eSATA, hard drive trays and screw-less installation methods along with the possibility to route water cooling out the back of the chassis. On top of that, it impressed with space for a large number of fans and excellent cable management possibilities. Xigmatek was one of the pioneers behind the all black interior which has now become a standard in the industry. Even though the original Midgard offered such extensive features, it took the market by storm because of the unbeatable value. The question remains if Xigmatek is able to repeat this success with the new Midgard II. The answer is clear: YES! On the exterior, the Midgard II utilizes the same metal mesh accents as the original Midgard, but Xigmatek goes a step further by employing a new surface material, proof that the designers have are always at the forefront of the newest developments in the case market. The top and front panels of the chassis feature this new surface by the name "Leather Touch", which resembles that of some of the best gaming mice in the world. Behind the dust filter protected front mesh, there is space for two 120 mm fans, with one such unit being present out of the box to cool the hard drive bays. A second unit has been placed in the rear of the chassis to expel hot air out the back. Two 120 or 140 mm units may be installed in the top of the case, while the side panel also offers space for two additional fans. Lastly, there is one more spot in the floor of the Midgard II, next to the dust filter protected opening for the bottom mounted power supply. This PSU bay is lined with foam to eliminate vibrations with the help of the four rubber mounts on which the power supply rests. The Midgard II also offers an extensive cable management system with multiple openings and clips, making a clean interior a definitive possibility, while the large hole under the mainboard tray allows for easy access to the CPU cooler backplate. In addition, the chassis also features water cooling holes and a screw-less system for the three 5.25 inch slots, while the PCI slots are secured with easy to use thumb screws. A brand new feature is the docking station in the top panel of the chassis, allowing you to utilize the hot-swap capability of modern hard drives - including the newest ones with SATA 6Gbps. Due the dual-cover design, it can easily be equipped with 2.5 or 3.5 inch units. Op top of that the Midgard II features two current USB 3.0 along with two USB 2.0 connectors and a pair of audio connectivity. Another unique feature is the possibility to install a slimline optical drive without blocking one of the 5.25 inch bays. Xigmatek includes the appropriate tray and front cover for such a usage scenario. The Midgard II can hold up two six 2.5 or 3.5 inch hard drives, utilizing separate hard drive trays. 3.5 inch units can be installed without the use of additional tools, thanks to the embedded metal pins in each tray, For those with extra long graphic cards up to 33 cm in length, the top cage may be removed to free up the required space. With this long list of features, along with the Xigmatek "Mono Cool" fan controller to control up to three fans, the Midgard II manages to deliver all the attribute to become just as successful as its predecessor, while continuing to deliver an unbelievable price point. 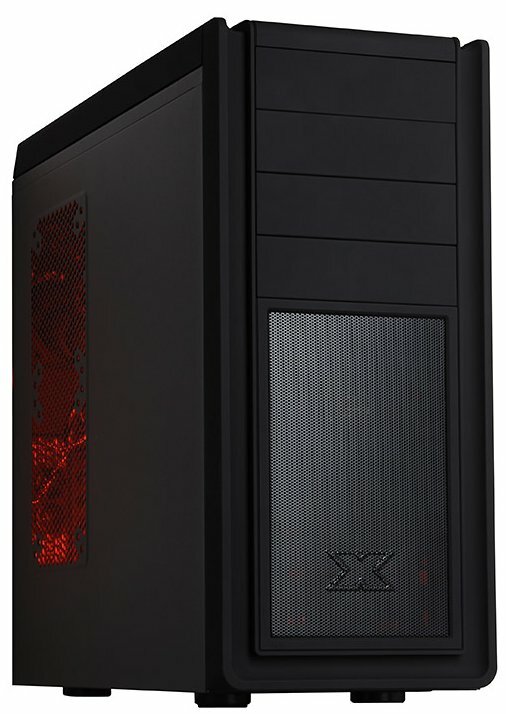 The Xigmatek Midgard II Midi-Tower - black will be available at the end of November for a price of 69,90 Euro exclusively at www.caseking.de.